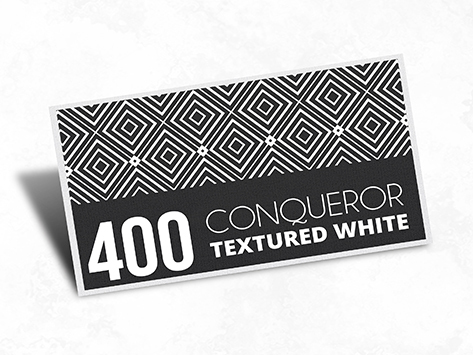 To ensure your files are printed correctly and your 400gsm Conqueror Textured White Postcards are delivered on time, please take the time to ensure you follow these steps. Double check that your artwork trim size matches the product you ordered. If you have any questions or are unsure how to complete any steps please call 0754431115 or email info@idprint.com.au as we are more than happy to help. Disclaimer: It is your responsibility to check and approve your artwork that you submit. We do not accept responsibility for spelling, grammar, dates, punctuation errors and suitability of colours. Supplied artwork is printed as is. Screen colours are never accurate; please check your CMYK specifications. We predominately print a CMYK printing process and as such, there will be a colour shift from what is displayed on your RGB computer monitor. There also may be a slight colour shift from print run to print run, due to factors such as humidity, coatings and inherent stock variation. Any files received in any other colour format (i.e. : RGB, Pantone, Lab, HSB) will still be printed and may not reproduce as your expectations.